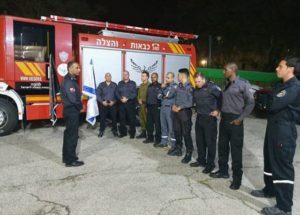 GONDER, ETHIOPIA (ANS) — As with the majority of disasters and humanitarian crises, Israel acted as a first responder to Ethiopia’s Simien Mountain fires after Prime Minister Netanyahu deployed firefighters and humanitarian aid on Saturday. Behold Israel said Media reports claim Ethiopia requested assistance from South Africa and Kenya before contacting Israel on Saturday. Israel’s delegation will work alongside local firefighting forces and includes a chopper. The fires at Simien National Park have been ongoing for several days as Ethiopia does not have the expertise or equipment needed, mainly a chopper, to control the fires. A reported 300 hectares of land have been burned.